If you have a special woman your life, then this is the right bridal set for her. 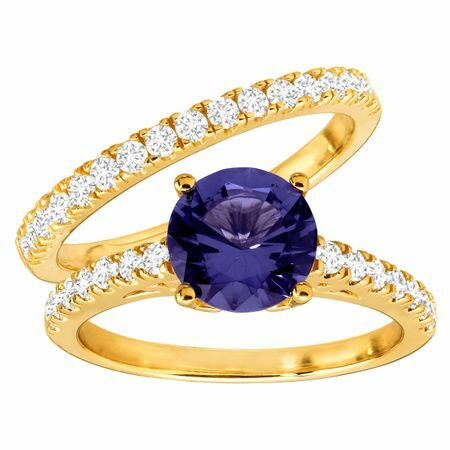 Especially if her favorite color is purple, the bright tanzanite center will bring out the twinkle in her eyes. A 2 ct simulated royal blue-purple tanzanite center stone is accompanied by round-cut white cubic zirconias, totaling 1 1/2 ct, along both the engagement and wedding bands. A luminous 14K gold plating over sterling silver ensures she'll love her high-shine piece for years to come. Ring face measures 5/16 inches stacked.